In collaboration with Paseo Academy of Fine and Performing Arts and Blue Valley North High School, the Design Learning Network co-facilitated the fourth annual Kansas City Design Learning Challenge on Friday, February 24, 2017. Approximately 50 high school students, alongside 25 educators and creatives gathered at our host site, the Kansas City Art Institute. With exceptional mentoring from The Rabbit Hole, this full-day program was dedicated to storytelling and envisioning positive impact on a local makerspace. Serving as our community client, Operation Breakthrough asked us to explore, imagine, and articulate future learning experiences in their soon to be constructed Maker Village. The 18,000 sq. ft. flexible space accommodates up to 340 students ages 5-13 (grades K-8) with space to grow. Coached by creatives from the Center for Architecture and Design alongside high school teachers and college design educators – we challenged student participants to tackle the design of the Maker Village’s environment, programming, and experiences from a young student’s point of view. In an immersive storytelling format, design narratives brought insightful learning experiences to life. By the conclusion of the event, our high school students produced and presented a series of Impact Stories. These stories served as proposals for Operation Breakthrough’s to consider as well as potential pathways for continued collaborations with the high school students. 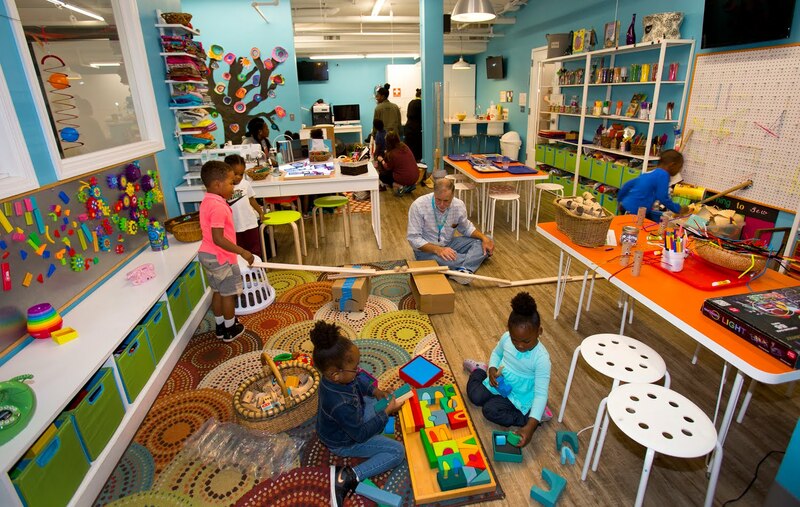 The Maker Village includes several inspiring learning spaces, including a customized STEM SmartLab by Creative Systems. Using a self-directed and personalized learning approach, the SmartLab engages learners in robotics, electronics, software engineering, mechanics, and structures to the engineering design process based on each child’s interests and abilities. From a young age, learners have the opportunity to develop critical thinking, problem-solving, collaboration, communications, and project management skills.